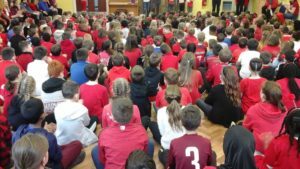 “Red Nose Day was like a blast to space!” “The whole school loved it!” “One of the greatest moments in the school.” As you can tell from the feedback we received from the children, Red Nose Day was a great success. This year the School Council organised the event and came up with the idea of holding a school talent show. All classes held their own talent competition and the winners performed their acts in front of the whole school during celebration assembly. Waterfield children raised an amazing £289.00! We would like to say a big thank you to the School Council for organising the event, the children who showcased their marvellous talents, to staff for supporting the event and to the ever generous parents donating towards a very worthy cause.